﻿Scientific ﻿work ﻿on ﻿the ﻿500 ﻿Million ﻿years ﻿old ﻿'Orsten' ﻿fossils ﻿can ﻿serve ﻿an ﻿example ﻿of ﻿the ﻿fruitful ﻿alliance ﻿between ﻿Biology ﻿and ﻿Palaeontology, ﻿not ﻿least ﻿in ﻿order ﻿to ﻿improve ﻿our ﻿understanding ﻿of ﻿Metazoan ﻿evolution ﻿in ﻿general. ﻿Indeed, ﻿'Orsten' ﻿fossils, ﻿now ﻿known ﻿from ﻿all ﻿around ﻿the ﻿World, ﻿have ﻿provided ﻿us ﻿with ﻿a ﻿unique ﻿window ﻿into ﻿life ﻿at ﻿the ﻿bottom ﻿of ﻿the ﻿Sea ﻿as ﻿early ﻿as ﻿in ﻿the ﻿Cambrian ﻿– ﻿and ﻿even ﻿in ﻿a ﻿three-dimensional ﻿view. ﻿Occurrences ﻿around ﻿the ﻿world; ﻿more ﻿pictures, ﻿e.g., ﻿in ﻿our ﻿gallery ﻿of ﻿Orsten ﻿animals. ﻿In ﻿2005 ﻿a ﻿group ﻿of ﻿researchers, ﻿C.O.R.E. 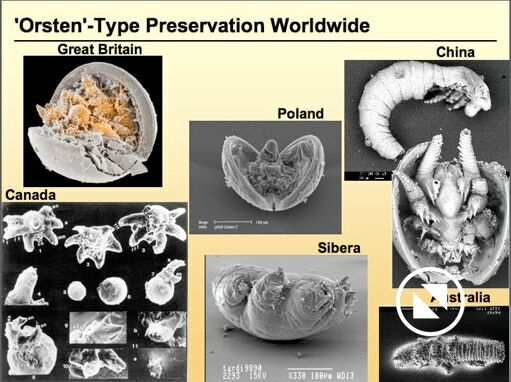 ﻿group, ﻿was ﻿founded ﻿as ﻿an ﻿informal ﻿international ﻿science ﻿alliance ﻿with ﻿a ﻿common ﻿interest ﻿in ﻿the ﻿exceptionally ﻿3D ﻿preserved ﻿'Orsten' ﻿fossils ﻿from ﻿the ﻿earliest ﻿period ﻿of ﻿the ﻿"Zoicum" ﻿(time ﻿of ﻿animal ﻿evidence), ﻿the ﻿Cambrian ﻿(ranging ﻿from ﻿542 ﻿to ﻿495 ﻿Million ﻿years ﻿before ﻿date). ﻿Until ﻿2015 ﻿the ﻿number ﻿of ﻿members ﻿increased ﻿to ﻿around ﻿40 ﻿from ﻿no ﻿less ﻿than ﻿8 ﻿countries ﻿from ﻿4 ﻿continents ﻿and ﻿Japan. ﻿The ﻿group ﻿consisted ﻿of ﻿the ﻿workgroup ﻿around ﻿Dieter ﻿Waloszek ﻿at ﻿the ﻿University ﻿of ﻿Ulm, ﻿several ﻿other ﻿workgroups ﻿such ﻿as ﻿in ﻿the ﻿UK ﻿and ﻿in ﻿Sweden, ﻿and ﻿single ﻿researchers. ﻿Study ﻿objects ﻿of ﻿C.O.R.E. ﻿were ﻿and ﻿still ﻿are ﻿in ﻿the ﻿main ﻿the ﻿'Orsten' ﻿fossils, ﻿but ﻿also ﻿broader ﻿aspects ﻿of ﻿palaeobiology ﻿(from ﻿pale-environment ﻿and ﻿habitual ﻿aspects ﻿to ﻿all ﻿aspects ﻿of ﻿morphology, ﻿ontogeny ﻿[development] ﻿and ﻿functional ﻿morphology, ﻿to ﻿interrelationships ﻿and ﻿phylogeny ﻿or ﻿evolution ﻿in ﻿general), ﻿taphonomy ﻿and ﻿geology ﻿in ﻿general. ﻿One ﻿issue ﻿of ﻿the ﻿international ﻿research ﻿alliance ﻿was ﻿the ﻿concentration ﻿of ﻿expertise ﻿about ﻿the ﻿'Orsten' ﻿and ﻿its ﻿fossils, ﻿'Orsten' ﻿sites ﻿in ﻿which ﻿these ﻿occur, ﻿related ﻿topics, ﻿and, ﻿last ﻿but ﻿not ﻿least, ﻿the ﻿dissemination ﻿of ﻿information ﻿on ﻿the ﻿'Orsten' ﻿as ﻿one ﻿of ﻿the ﻿most ﻿informative ﻿and ﻿significant ﻿early ﻿Palaeozoic ﻿lagerstaetten. ﻿To ﻿serve ﻿these ﻿purposes, ﻿a ﻿website ﻿' ﻿was ﻿crated ﻿with ﻿simple ﻿tools, ﻿but ﻿with ﻿as ﻿much ﻿information ﻿as ﻿we ﻿could ﻿accumulate ﻿– ﻿corrected ﻿and ﻿updated ﻿as ﻿regular ﻿as ﻿possible. ﻿The ﻿C.O.R.E. ﻿'Orsten' ﻿website ﻿was ﻿particularly ﻿built ﻿to ﻿present ﻿information ﻿about ﻿the ﻿'Orsten' ﻿in ﻿geological ﻿terms ﻿and ﻿its ﻿fossils ﻿– ﻿mainly ﻿animals. ﻿Besides ﻿this, ﻿it ﻿also ﻿tried ﻿to ﻿provide ﻿some ﻿background ﻿data ﻿on ﻿the ﻿history ﻿of ﻿'Orsten' ﻿research ﻿(from ﻿the ﻿founder ﻿to ﻿the ﻿activities ﻿today), ﻿methods ﻿and ﻿also ﻿relevant ﻿literature. ﻿We ﻿also ﻿started ﻿to ﻿present ﻿our ﻿first ﻿thoughts ﻿about ﻿more ﻿general ﻿aspects ﻿of ﻿the ﻿morphology, ﻿phylogeny ﻿and ﻿evolution ﻿of ﻿the ﻿animals, ﻿Metazoa. ﻿The ﻿literature ﻿list ﻿included ﻿links ﻿to ﻿download ﻿underlying ﻿PDFs, ﻿but ﻿at ﻿that ﻿early ﻿time ﻿we ﻿ran ﻿out ﻿of ﻿webspace ﻿very ﻿soon. ﻿Updating ﻿was ﻿another ﻿problem. ﻿The ﻿new ﻿approach ﻿shall ﻿overcome ﻿this, ﻿but ﻿since ﻿the ﻿majority ﻿of ﻿papers ﻿(all ﻿from ﻿Dieter ﻿Waloszek) ﻿can ﻿be ﻿obtained ﻿or ﻿requested ﻿via ﻿the ﻿website ﻿of ﻿RESEARCH ﻿GATE, ﻿we ﻿shall ﻿only ﻿offer ﻿links ﻿to ﻿selected ﻿papers. ﻿E.g. ﻿those ﻿of ﻿the ﻿late ﻿Klaus ﻿J. ﻿Müller, ﻿which ﻿are ﻿not ﻿available ﻿otherwise. ﻿What ﻿needs ﻿to ﻿be ﻿done ﻿with ﻿regard ﻿to ﻿the ﻿new ﻿'Orsten' ﻿website ﻿is ﻿to ﻿update, ﻿correct ﻿and ﻿re-incorporate ﻿the ﻿old ﻿data, ﻿and, ﻿in ﻿the ﻿future, ﻿to ﻿add ﻿more ﻿information ﻿on ﻿'Orsten' ﻿occurrences ﻿from ﻿other ﻿sites, ﻿particularly ﻿from ﻿China. ﻿These ﻿yielding ﻿not ﻿only ﻿the ﻿hitherto ﻿oldest ﻿fossils, ﻿but ﻿also ﻿uncovered ﻿the ﻿larges ﻿specimens ﻿in ﻿this ﻿type ﻿of ﻿preservation. 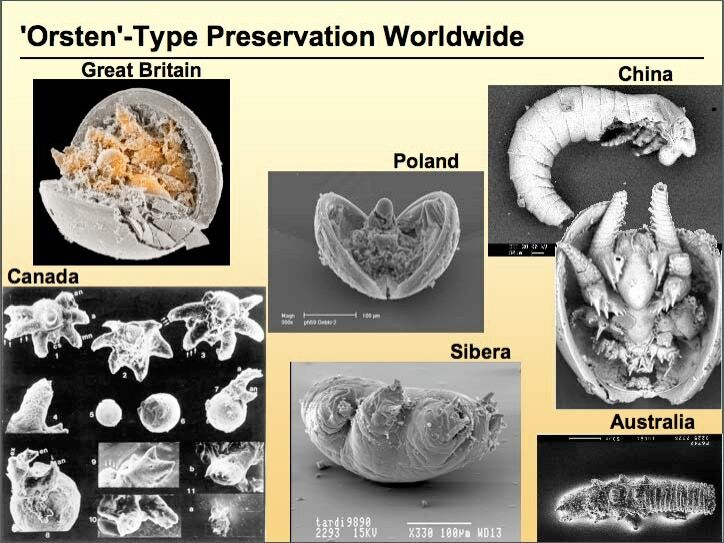 ﻿Particularly ﻿the ﻿discoveries ﻿in ﻿China ﻿have ﻿contributed ﻿not ﻿only ﻿significantly ﻿to ﻿our ﻿knowledge ﻿about ﻿and ﻿around ﻿the ﻿'Orsten' ﻿by ﻿adding ﻿different ﻿species, ﻿but ﻿they ﻿also ﻿added ﻿to ﻿our ﻿knowledge ﻿about ﻿lithological, ﻿preservational ﻿and ﻿taxonomical ﻿issues. ﻿More ﻿information ﻿will ﻿also ﻿be ﻿added ﻿on ﻿the ﻿localities ﻿from ﻿Newfoundland, ﻿UK, ﻿Poland, ﻿Siberia, ﻿and ﻿Australia. ﻿And ﻿of ﻿course ﻿we ﻿have ﻿to ﻿add ﻿information ﻿about ﻿the ﻿new ﻿methods ﻿applied ﻿in ﻿the ﻿after-Müller ﻿time. ﻿Altogether ﻿the ﻿'Orsten' ﻿is ﻿the ﻿longest ﻿ranging ﻿type ﻿of ﻿conservat ﻿lagerstaetten, ﻿outranging ﻿Chengjiang ﻿from ﻿China ﻿– ﻿only ﻿early ﻿Cambrian ﻿– ﻿and ﻿Burgess ﻿Shale ﻿– ﻿only ﻿early ﻿to ﻿Middle ﻿Cambrian ﻿– ﻿by ﻿far: ﻿'Orsten' ﻿fossils ﻿have ﻿become ﻿known ﻿from ﻿the ﻿early ﻿Cambrian ﻿to ﻿the ﻿latest ﻿Cambrian ﻿(Furongian), ﻿possibly ﻿extending ﻿even ﻿into ﻿the ﻿lower ﻿Ordovician! ﻿Lastly, ﻿the ﻿fossils ﻿from ﻿the ﻿new ﻿localities ﻿in ﻿China ﻿and ﻿new ﻿investigations ﻿of ﻿old ﻿and ﻿new ﻿material ﻿from ﻿Europe ﻿provided ﻿us ﻿with ﻿new ﻿data ﻿on ﻿the ﻿evolution ﻿of ﻿animal ﻿groups ﻿and ﻿helped ﻿to ﻿improve ﻿and ﻿widen ﻿our ﻿evolutionary ﻿interpretations ﻿significantly. ﻿This ﻿is ﻿to ﻿tell ﻿that ﻿C.O.R.E. ﻿activities ﻿have ﻿continued ﻿and ﻿did ﻿not ﻿stop ﻿after ﻿a ﻿general ﻿agreement ﻿on ﻿closing ﻿the ﻿website ﻿and ﻿dissolving ﻿the ﻿group. ﻿The ﻿latest ﻿article ﻿from ﻿2019, ﻿as ﻿a ﻿n ﻿example, ﻿depicts ﻿finds ﻿of ﻿larval ﻿phosphatocopine ﻿crustaceans ﻿from ﻿Poland ﻿(Olempska ﻿et ﻿al. ﻿2019), ﻿so ﻿we ﻿do ﻿hope ﻿that ﻿work ﻿goes ﻿on.